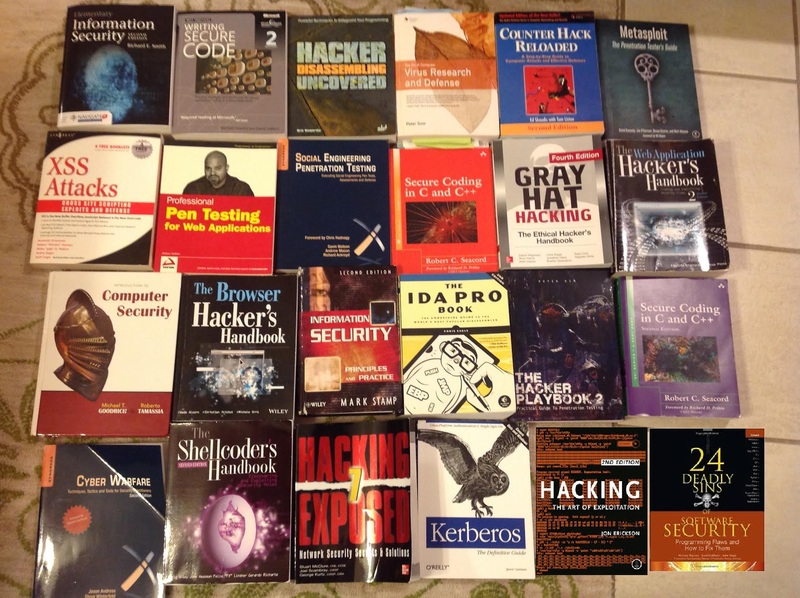 Here are the cyber-security related books I have read. IEEExplore provides full-text access to IEEE transactions, journals, magazines and conference proceedings published since 1988 and all current IEEE Standards. ACM Digital Library provides full-text access to ACM journals and conferences. Final Report on Summit on Education in Secure Software. CISSP® - Certified Information Systems Security Professional . Department of Defense Directive 8570 (DoDD 8570). Israeli Test on Worm Called Crucial in Iran Nuclear Delay. The Complete, Unofficial TEMPEST Information Page. FIPS Special Publications Drafts (Potential New Standards). Secure Hash Standard ( Recent Draft) . Recommendation for Key Management Part 1: General . FIPS46-3 (DES) ( FIPS46-2 ). MD5 (RFC 1321)) (Md5.c by Ronald L. Rivest). Computer Emergency Response Team and United States Computer Emergency Readiness Team. The Orange Book (TRUSTED COMPUTER SYSTEM EVALUATION CRITERIA). Common Criteria for Information Technology Security Evaluation. The Data Encryption Standard in Detail. Attack on RC4 implemented in WEP. Timing attacks on RSA and D-H.
Chinese Remainder Theorem to Break RSA when e=3. RSA Encoding and Decoding Demonstration. BigDigits multiple-precision arithmetic source code. Handbook of Applied Cryptography . A good website about RSA. RainbowCrak project, an implementation of the rainbow table password/hash cracking method. A Survey of PKI Components and Scalability Issues (available on any on-campus computer). Common Vulnerabilities and Exposues by MITRE. United States Computer Emergency Readiness Team. CSIS: 20 Critical Security Controls. Open Vulnerability and Assessment Language. Common Attack Pattern Enumeration and Classification. Malware Attribute Enumeration and Characterization. Organically Assured and Survivable Information Systems (OASIS). Computer Security in Smart Grid Advanced Metering Infrastructure . Internet Denial of Service Attacks and Defense Mechanisms. Collage System at Georgia Tech (Paper at USENIX 2010). Mandatory Access Control in BSD. File System Access Control Lists in BSD. Windows Vista Integrity Mechanism Technical Reference. Anatomy of Security-Enhanced Linux (SELinux). sKyWIper (also known as Flame) Analysis Report. Hacking: The Art of Exploitation, 2nd Edition by Jon Erickson. See the [Calendar] page for homework and other assignments. Solutions of homework assignments will be distributed in class. 2015 Offering Of Offensive Computer Security. 2014 Offering Of Offensive Computer Security (by Owen Redwood). 2013 Offering Of this Course (by Owen Redwood).